While most couples say they wouldn't change a thing about their wedding once it's been and done, some do regret not having someone there to record it all on video. Indeed for a lot of people there's nothing like the anticipation of sitting down to see all the goings on they might have missed from the big day months after people have forgotten what colour the button holes were and if they matched the bridesmaids' dresses! But unlike the majority of wedding couples, one pair of newlyweds weren't curled up at home alone with a glass of vino and a packet of tissues in order to revisit their special moments months after the big day had been and gone - they actually watched their day unfold on the day, surrounded by their friends and family. 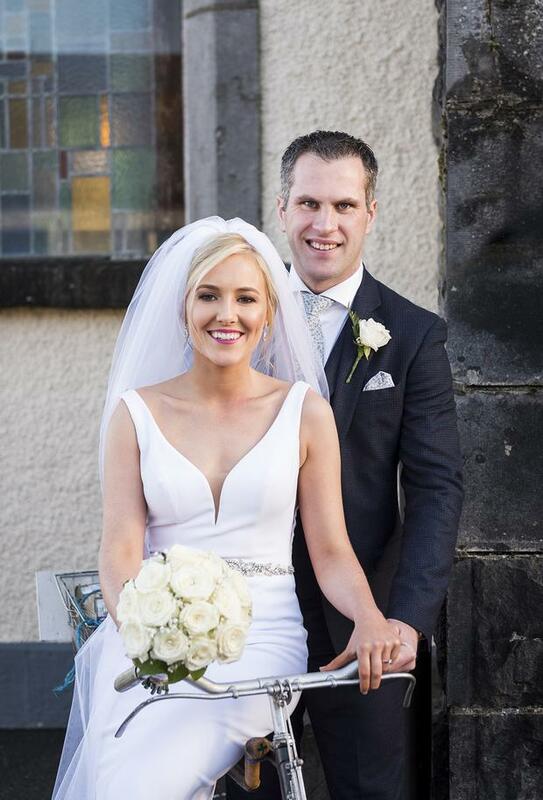 Damian O'Boyle from Sligo and Niamh Cregg from Roscommon tied the knot in St Asicus Church in Co. Roscommon. Later that evening, surrounded by their friends and family at The Landmark Hotel, the couple were treated to a same day edit of their wedding - which also happened to include a very nostalgic 'call-back' to a joke their priest made at their ceremony. "Our priest had made a joke about Sally O'Brien in the old Harp ad. People were talking about it after the ceremony and lo and behold the ad appears in our wedding video." "The whole thing was really special," bride Niamh told THEVOW.ie, "I loved the idea of having something like it instead of any other entertainment in between the meal, so it worked out really well." Two days after the wedding the couple were sent their video complete with their reactions. The 'same day edit' is by no means a new trend, but it's one that more couples are considering as an alternative to other entertainment to 'wow' guests. Videographer Johnny from weddingmoments.ie, who edits his videos after the ceremony is finished and family photos are done, creates his edits as his couples and their guests have sat down for their meal. It's then all done in time to be shown before the after-party really starts. "Any time I've done it at a wedding people are shocked - they just say 'wow I've never seen anything like that before'." Of course Damian and Niamh's edit was a little different to others - in that Johnny managed to actually find and splice in a 1979 TV ad the priest had referenced in his homily earlier in the day, making for quite the call back. "The guests loved it on the day, and they're still talking about it now," says Niamh. "Most of the videos would be three or four minutes but I had a few ideas in my head from the day for Damian and Niamh - I just went hell for leather with that one," says Johnny. "I was glad it went down well - it's the first time I've questioned myself and my work with that one. It was a bit of a risk but it worked!" The same day video is an extra service some videographers provides for couples which they pitch as 'alternative entertainment' for weddings. It can involve interviewing couples separately on the morning of their wedding, asking them how they met, and what they expected the from the day ahead, or even a bride simply reading the letter sent to her by her groom-to-be that morning. Do guests really want to see a wedding ceremony they've just been to? The 'same day video edit' trend spiked in popularity across the globe back in 2014, with the Huffington Post calling it 'the wedding trend the US needs to catch up on', but it hasn't gone down well across the board. It could possibly be argued that guests might not want to re-watch an event they've just attended hours before, however it could also be said that as a nation of nosy folk, and the opportunity to go 'behind the scenes' of the day can shed new light on proceedings and give people a special insight into things they might have missed. One US videographer also suggested that: "A same-day edit is a great way to 'wow' guests who were unable to attend the ceremony portion of the day." While it might generate a buzz for the couple and their guests - some couples enjoy the anticipation of receiving their official wedding photos and video once the big day has been and gone and may therefore prefer to wait for the main feature to be delivered weeks later. Johnny admits this can be an issue but says: "You definitely need something to look forward to with the main video, but this way you get to watch it with 300 of your guests all watching it at the same time." "The reason people go for it is the entertainment," Johnny says. "it's just great craic." It could go wrong too - what if the bride or groom sees it and realises their dress or suit doesn't look as well as they thought on camera? Panic! But unlikely to happen. Obviously it hinges on your videographer too. It takes enormous skill under such time pressure to produce something good enough to be broadcast to a room full of well-wishers, so hacking something together with an iPhone is not likely to do the trick. Do you like the idea of the same day video edit? Let us know in our poll below! Karen Birney Will any of these be making an appearance in your 2019 wedding?! Karen Birney Every December Pinterest reveals its top wedding trends for the year ahead, and if the photo sharing site is telling us anything it's that couples are doing things very differently for 2019.